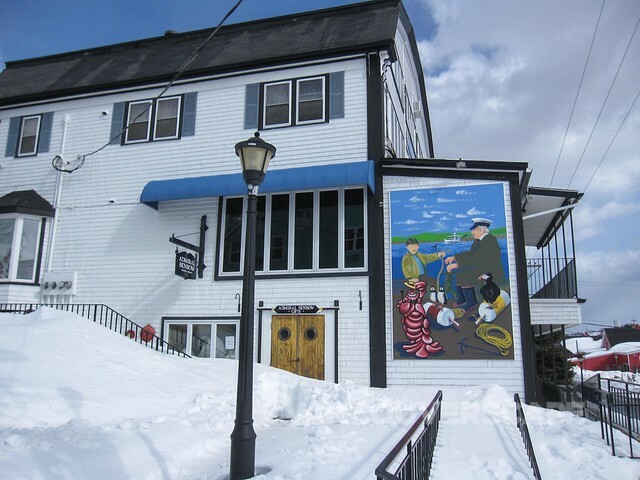 This pretty little coastal town, located in Southwest Nova Scotia just over an hour from Halifax, is filled with charming inns, shops, and restaurants. 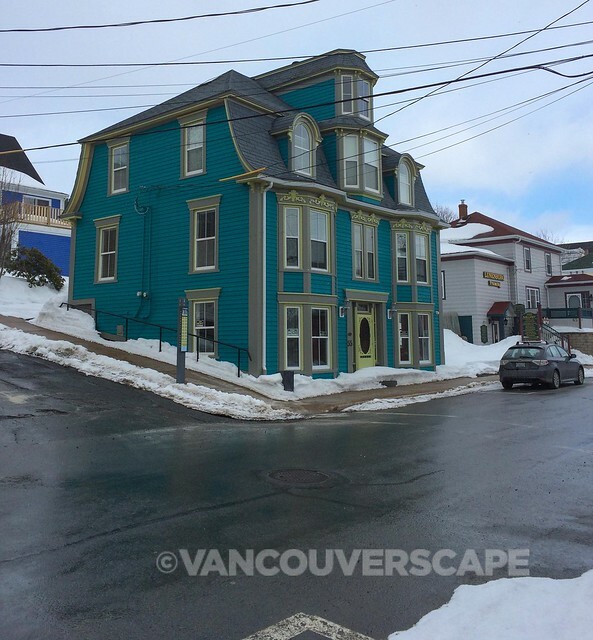 Even though some of streets leading down to the waterfront were blocked due to the crazy snowfall that recently hammered the province, Halifax-based travel writer Tiffany Thornton and I still managed a walk through parts of town. Short jaunts, actually, as we were challenged by the frigid temperature and strong wind. 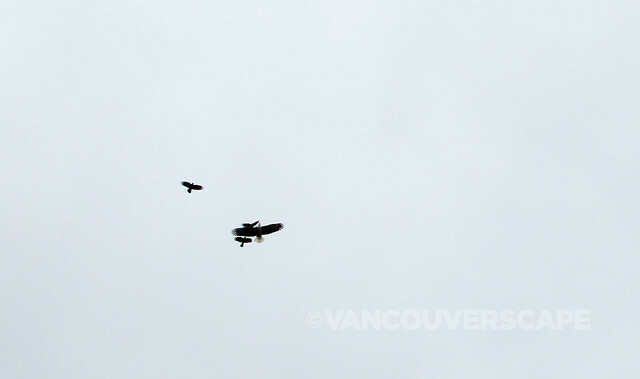 High above, a lone Bald eagle was battling it out with a trio of crows against a stark white sky. 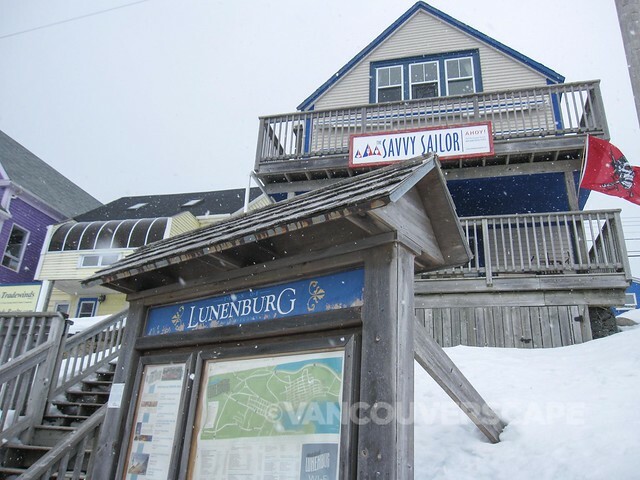 Lunenburg definitely takes on a quieter vibe in winter, and The Grand Banker Restaurant on Montague Street (one of very few open, even on a Saturday) was filled with locals enjoying a late weekend lunch. In fact, it felt as though we had the town all to ourselves. Granted most of the shops and restaurants don’t get into gear until early May, however a quick tour on foot was enough to give me an impression of what makes this a highly sought after tourist destination. 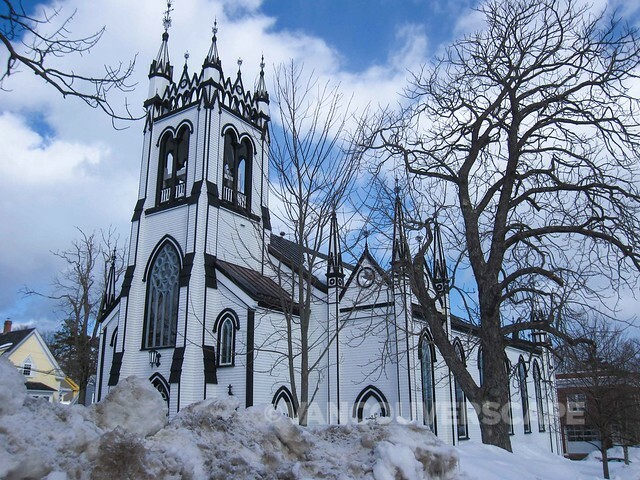 One of the town’s landmarks is the striking black and white St. John’s Anglican Church, the second oldest in Canada (St. Paul’s Church in Halifax, founded in 1750, takes grand honour). 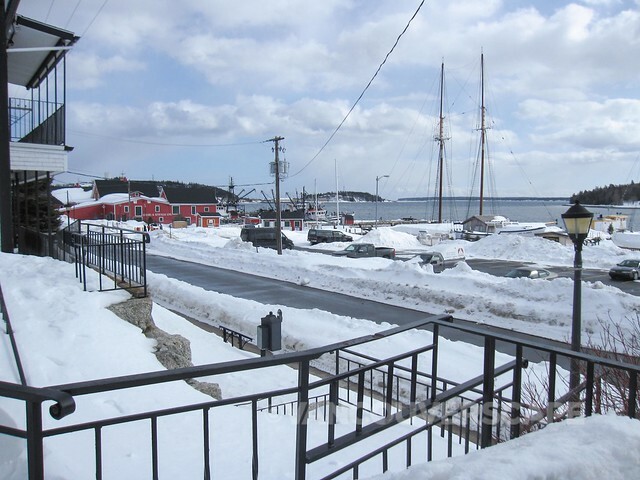 Through insistent chilly late winter winds, light snowfall gave way to sunshine, casting a glow on stately homes and historic landmarks that add to Lunenburg’s delightful atmosphere. I closed my eyes and imagined how this town comes to life in summer, with the whiff of fresh sea air permeating the nostrils as the close to 200 shops, art galleries, museums and restaurants fill with locals and tourists alike. Old Town Lunenburg is considered the best surviving example of a British model town plan with straight streets and square corners, created from “whatever tract of wilderness it was the King’s pleasure to colonize”. Although 21 North American settlements (including Savannah, Georgia and Niagara-on-the-Lake, Ontario) were designed in this fashion, only Lunenburg has managed to retain the layout in pristine condition. The town received UNESCO World Heritage status 20 years ago. 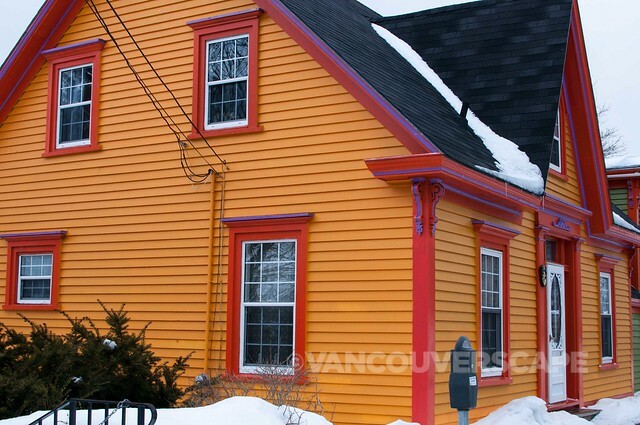 Lunenburg’s also been crowned Prettiest Painted Places in Canada and Port City of the Year. Unfortunately, I wasn’t able to catch anyone chatting in Lunenburg English, a unique dialect influenced by both New England English and German. When the settlement was created in 1753, most of the inhabitants at the time were of German-speaking Protestant German, Swiss, and Montbéliardian French origin. Each family received one town lot, and the steep hills are a result of London-based Board of Trade and Plantations developing the town without paying any mind to the local topography. The vivid colours of the wooden homes (the majority of the buildings here) are from the 18th and 19th centuries. As mentioned above, the trip by car takes just over an hour. A word of warning: the highway is clearly marked heading out of town, soon connecting to the 103 West, however we were turned around a couple of times headed back, as there’s a void of Halifax signage in the other direction. Lunenburg, I hopefully have not seen the last of you! My rental car was provided by Tourism Nova Scotia. Meals, gas, and tea were on my own dime. Opinions, as always, are my own. Please do come again! 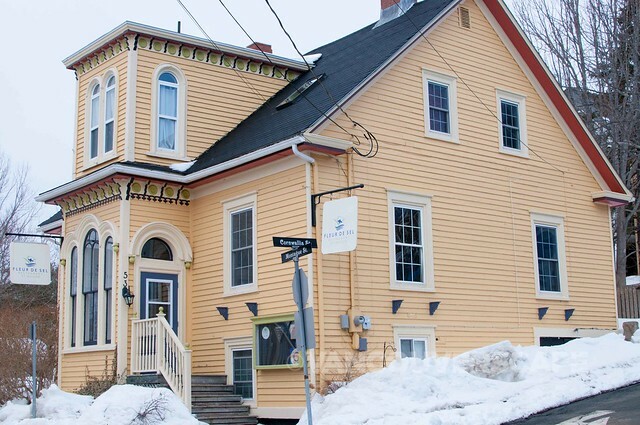 As you learned, Lunenburg is stunning at any time with many cultural events. We offer tours (history, architecture and culture OR a haunted version, both including St John’s Church interior) year round. 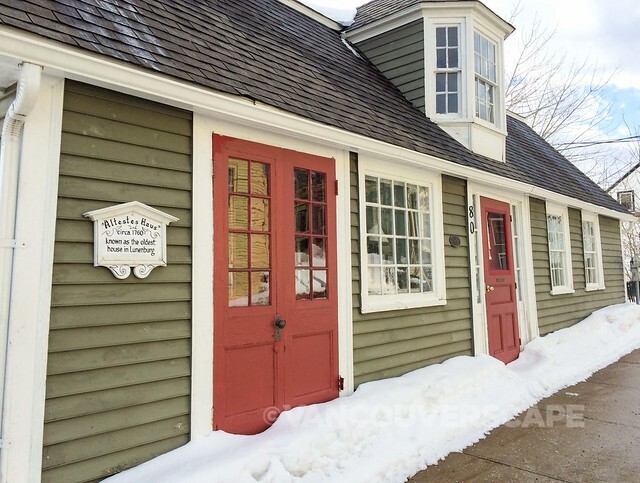 Shelah Allen co-owner, Lunenburg Walking Tours. Thanks for visiting our site! We do hope to make it out again in warmer weather as this charming town deserves a closer look!